This is American Thanksgiving and we visit what's whacky as reported by the Huffington Post a few years ago. Well, it’s actually the 31st instalment of this Detroit footrace, named “Fifth Third” after the bank that founded it. The titles continue their wonkiness on race day: there’s the 10k Turkey Trot, 5k Stuffing Strut, and Mashed Potato Mile (completing more than one is a Drumstick Double). Don your craziest costume, and you might win the contest! That’s right, the catchphrase at this 21-and-over bar fest is “hot nuts.” A thousand pounds of actual turkey yarbles will be served alongside pizza and beer at Parkside Pub in Huntley, Illinois on the eve of Thanksgiving. Catch some local bands and leave with a story to tell around the Thanksgiving table. Seattle ends their Thanksgiving 5k with a hefty serving of side dish: in the Mashed Potato Much Off, the one to shovel the most potatoes in four minutes wins a pile of cash. You might also score prizes if you beat the runner who wears a turkey suit during the race. 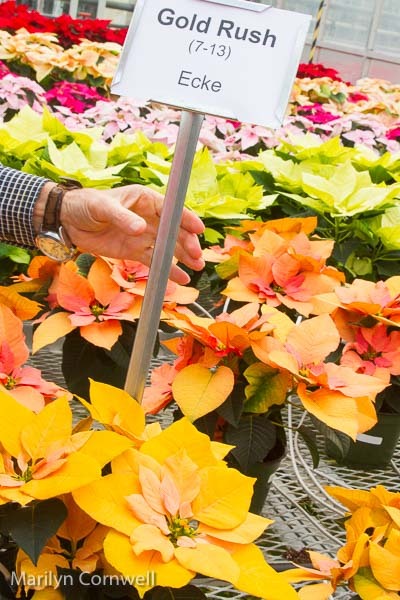 Here's our orange Poinsettia for the American Thanksgiving table.